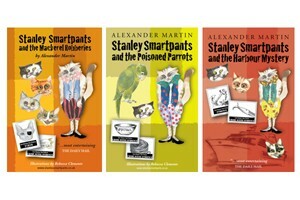 Alexander Martin, author of the Stanley Smartpants full length novels, will be signing copies of his books during the show. They are hilarious detective stories in which all the characters are cats, but who behave as if they are human beings. They drive cars, use mobile phones, play computer games etc. When they’re hungry they go to Cat-Tucky Fried Chicken or Catdonalds. The current movie in town is Cat Titanic starring Lionardo di Catrio and Kat Winslett, and directed by Stephen Spielcat! The action takes place in Cat-Haven-on-Sea, which is based on Paignton in Devon. In the ‘Mackerel Robberies’ the first book in the series the skeleton of a dead mackerel is found at a series of puzzling robberies. In the ‘Harbour Mystery’ a yacht owned by the squintillionaire Sir Lancelot-Smiles-a-Lot is broken into in Brixcat Harbour, and In the ‘Poisoned Parrots’ an outbreak of stolen parrots plunges Cat-Haven-on-Sea into chaos. 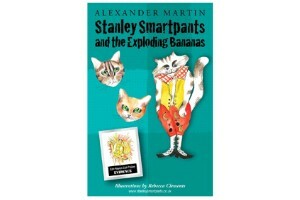 In the latest story, Stanley Smartpants and the Exploding Bananas, a sickness epidemic engulfs Cat-Haven, and the naughty fun loving kittens, Snugsy and Bugsy, are responsible for a terrifying explosion which puts Stanley in Torcat Hospital. Investigating the crimes are Sergeant Stanley Smartpants, his boss Chief Inspector Derek Dimwit, and a host of crazy characters. The stories were written for children, but seem to appeal as much to adults. From emails received we can happily say that the appropriate age range is 6 – 90! Currently there are four books in the series, costing £8.99 each.